Adobe Flash Player makes the Flash content accessible on various operating systems such as Windows, OS X and Linux, and is available free of charge for common web browsers (as a plug-in) under a few of the major operating systems, some smartphones and tablets, and a few other electronic devices using Flash Lite. Flash originated with the application SmartSketch, developed by Jonathan Gay. It was published by FutureWave Software, which was founded by Charlie Jackson. SmartSketch was a drawing application for pen computers running the PenPoint OS. When PenPoint failed in the marketplace, SmartSketch was ported to Microsoft Windows and Mac OS. As the Internet became more popular, FutureWave added cell animation editing to the vector drawing capabilities of SmartSketch and released FutureSplash Animator on multiple platforms. FutureWave approached Adobe Systems with an offer to sell them FutureSplash in 1995, but Adobe turned them down at that time. FutureSplash was used by Microsoft in its early work with the Internet (MSN), and also by Disney Online for their subscription-based service Disney's Daily Blast. In 1996, FutureSplash was acquired by Macromedia and released as Flash. 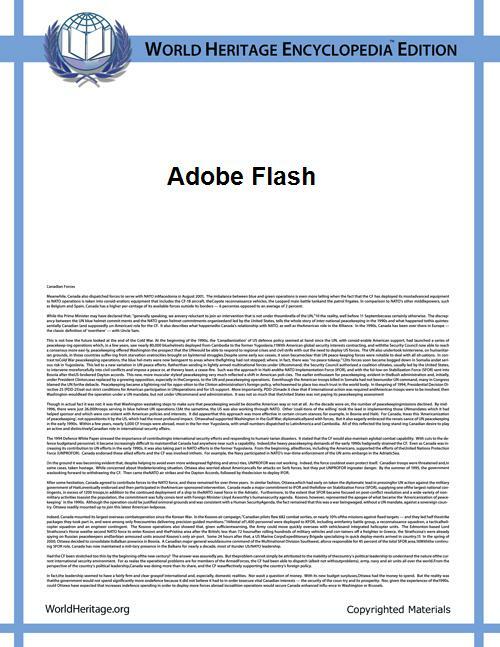 Flash is currently developed and distributed by Adobe Systems, as the result of its 2005 purchase of Macromedia. As of February 2009, the specifications removing the restrictions on the use of SWF and FLV/F4V specs have been published. The Flash Cast protocol—now known as the Mobile Content Delivery Protocol—and AMF protocols have also been made available, with AMF available as an open source implementation, BlazeDS. Work on the device porting layers is in the early stages. Adobe intends to remove the licensing fees for Flash Player and Adobe Integrated Runtime (AIR) for devices at their release for the Open Screen Project. As of 2012, the Open Screen Project is no longer accepting new applications according to partner BSQuare. However paid licensing is still an option for device makers who want to use Adobe software. Flash Player for smart phones was made available to handset manufacturers at the end of 2009. Adobe stops supporting Flash Player for mobile device browsers after the release of 11.1. It continues to support deploying Flash based content as mobile applications via Adobe AIR. In November 2011 there were a number of announcements that demonstrated a possible decline in demand for rich Internet application architectures, and Flash in particular. Furthermore, in November 2011 Adobe announced the end of Flash for mobile platforms or TV, instead focusing on HTML5 for browser content and Adobe AIR for the various mobile application stores. Pundits questioned its continued relevance even on the desktop and described it as "the beginning of the end". BlackBerry LTD (formerly known as RIM) announced that it would continue to develop Flash for the PlayBook. Adobe Flash Player's planned discontinuation as a separately available NPAPI browser plugin for Linux (see Availability on desktop operating systems), although technically just an API change, is notable in this context because availability of new Adobe Flash Players on Linux will be restricted to one browser. Adobe Flash continues to be a favored animation program for low-cost 2D television and commercial animation, in competition with Anime Studio and Toon Boom Animation. Notable users of the software include DHX Media Vancouver for productions including Pound Puppies and My Little Pony: Friendship is Magic, Fresh TV for Total Drama, Nelvana for 6teen and Clone High, Williams Street for Metalocalypse and Squidbillies, and Nickelodeon Animation Studios for Wow! Wow! Wubbzy! El Tigre: The Adventures of Manny Rivera, Danny Phantom and Happy Tree Friends. Flash is less commonly used for feature-length animated films; however, 2009's The Secret of Kells, an Irish film, was animated primarily in Adobe Flash, and was nominated for an Academy Award for Best Animated Feature at the 82nd Academy Awards. Flash files are in the SWF format, traditionally called "ShockWave Flash" movies, "Flash movies", or "Flash applications", usually have a .swf file extension, and may be used in the form of a web page plug-in, strictly "played" in a standalone Flash Player, or incorporated into a self-executing Projector movie (with the .exe extension in Microsoft Windows). Flash Video files[spec 1] have a .flv file extension and are either used from within .swf files or played through a flv-aware player, such as VLC, or QuickTime and Windows Media Player with external codecs added. Flash Player 11 introduced a full 3D shader API, called Stage3D, which is fairly similar to WebGL. The reliance on Adobe for decoding Flash makes its use on the World Wide Web a concern for advocates of open standards and free software — the completeness of its public specifications are debated, and no complete implementation of Flash is publicly available in source code form with a license that permits reuse. Generally, public specifications are what makes a format re-implementable (see future proofing data storage), and reusable codebases can be ported to new platforms without the endorsement of the format creator. Adobe's restrictions on the use of the SWF/FLV specifications were lifted in February 2009 (see Adobe's Open Screen Project). However, despite efforts of projects like Gnash, Swfdec and Lightspark, a complete free Flash player is yet to be seen, as of September 2011. For example, Gnash cannot use SWF v10 yet. Notably, Gnash has been a long standing high priority project of the Free Software Foundation, since at least 2007 and it was ranked number one in September 2011. In April 2006, the Flash SWF file format specification was released with details on the then newest version format (Flash 8). Although still lacking specific information on the incorporated video compression formats (On2, Sorenson Spark, etc. ), this new documentation covered all the new features offered in Flash v8 including new ActionScript commands, expressive filter controls, and so on. The file format specification document is offered only to developers who agree to a license agreement that permits them to use the specifications only to develop programs that can export to the Flash file format. The license forbids the use of the specifications to create programs that can be used for playback of Flash files. The Flash 9 specification was made available under similar restrictions. The Adobe Flash Professional multimedia authoring program is used to create content for the Adobe Engagement Platform, such as web applications, games and movies, and content for mobile phones and other embedded devices. Open source projects like Ajax Animator aim to create a Flash development environment, complete with a graphical user environment. Alternatively, programs such as Vectorian Giotto, swfmill, SWFTools, and MTASC provide tools to create SWF files, but do so by compiling text, ActionScript or XML files into Flash animations. It is also possible to create SWF files programmatically using the Ming library, which has interfaces for C, PHP, C++, Perl, Python, and Ruby. Haxe is an open source, high-level object-oriented programming language geared towards web-content creation that can compile Flash files. Many shareware developers produced Flash creation tools and sold them for under US$50 between 2000 and 2002. In 2003 competition and the emergence of free Flash creation tools had driven many third-party Flash-creation tool-makers out of the market, allowing the remaining developers to raise their prices, although many of the products still cost less than US$100 and work with ActionScript. As for open source tools, KToon can edit vectors and generate SWF, but its interface is very different from Macromedia's. Another, more recent example of a Flash creation tool is SWiSH Max made by an ex-employee of Macromedia. Toon Boom Technologies also sells a traditional animation tool, based on Flash. In addition, several programs create .swf-compliant files as output from their programs. Among the best-known of these is Screencast, which leverages the ability to do lossless compression and playback of captured screen content to produce demos, tutorials, or software simulations of programs. These programs are typically designed for use by non-programmers, and create Flash content quickly and easily, but cannot actually edit the underlying Flash code (i.e. the tweening and transforms, etc.). Screencam is perhaps the oldest screencasting authoring tool to adopt Flash as the preferred output format, having been developed since the mid-90s. The fact that screencasting programs have adopted Flash as the preferred output is testament to Flash's presence as a ubiquitous cross-platform animation file format. Other tools focus on creating specific types of Flash content. GoAnimate is a cloud-based platform for creating and distributing high-quality animated videos. Anime Studio is a 2D animation software package specialized for character animation that creates SWF files. Express Animator is similarly aimed specifically at animators. Question Writer publishes its quizzes to Flash file format. Users who are not programmers or web designers will also find on-line tools that allow them to build full Flash-based websites. One of the oldest services available (1998) is FlashToGo. Such companies provide a wide variety of pre-built models (templates) associated to a Content Management System that empowers users to easily build, edit and publish their websites. Other sites, that allows greater customization and design flexibility are Wix.com and CirclePad. Adobe wrote a software package called Adobe LiveMotion, designed to create interactive animation content and export it to a variety of formats, including SWF. LiveMotion went through two major releases, but failed to gain any notable user base. In February 2003, Macromedia purchased Presedia, which had developed a Flash authoring tool that automatically converted PowerPoint files into Flash. Macromedia subsequently released the new product as Breeze, which included many new enhancements. In addition, (as of version 2) Apple's Keynote presentation software also allows users to create interactive presentations and export to SWF. Flash Player 11.2 does not play certain kinds of content unless it has been digitally signed. This move by Adobe, together with the abandonment of Flex for Apache, was criticized as a way to lock out independent tool developers in favor of users of Adobe's commercial tools. Adobe Flash Player exists for a variety of desktop operating systems, including Windows, Mac OS X, and Linux. In 2011, Adobe claimed that 99% of desktop PCs had Flash Player installed. In February 2012, Adobe announced the discontinuation of its NPAPI Flash plugin for Linux from version 11.2. Newer versions will not be available from Adobe, but integrated with Google Chrome, using its PPAPI instead. Security updates for the NPAPI version will still be provided for 5 years. Since version 11 of Adobe Flash Player, released October 4, 2011, 64-bit and 32-bit builds for Windows, Mac and Linux have been released in sync. Previously, Adobe offered experimental 64-bit builds of Flash Player for Linux, from November 11, 2008 to June 15, 2010. Adobe Flash Player exists for a variety of mobile operating systems, including Android (since version 2.2), Pocket PC/Windows CE, QNX (e.g. on BlackBerry PlayBook), Symbian, Palm OS, and webOS (since version 2.0). In November 2011, however, Adobe announced the withdrawal of support for Flash on mobile devices. Adobe is reaffirming its commitment to "aggressively contribute" to HTML5. The mobile version of Internet Explorer 8 for Windows Phone cannot play Flash content. The IE9 web browser on Microsoft Windows Phone 7.5 ('Mango') cannot play Flash content either. Any Flash player must be able to animate on top of video renderings. This obligation may, depending on graphic APIs exposed by the operating system, prohibit using a video overlay, like a traditional multimedia player would use, with the consequence that color space conversion and scaling must happen in software. For example, on Linux, native Xv video scaling can not be used because it is made to take video in the form that comes from the decoder – in YUV color space. However, Adobe Flash Player is able to make use of VDPAU for decoding (provided that the computer has an Nvidia GPU), making the Linux client partially hardware accelerated. The same challenge arises with native video capability in the browser, however the implementor may choose a different compromise between features and performance. For example, the KHTML layout engine does use Xv, and so cannot draw on top of the video. Rather than displaying its video controls on top of the video, the video scaling is reduced to fit them below. Flash Player build 11.2.202.228 for Linux has introduced a video rendering bug with Nvidia hardware acceleration, resulting in discoloured Flash videos. This bug is caused by the red palette being rendered as blue. The problem has been confined to Flash Player and remains unfixed as of April 2012. A workaround has been implemented in VDPAU. Most current browsers have a feature to block plugins, playing one only when the user clicks it. Opera versions since 10.5 feature native Flash blocking. Opera Turbo requires the user to click to play Flash content, and the browser also allows the user to enable this option permanently. 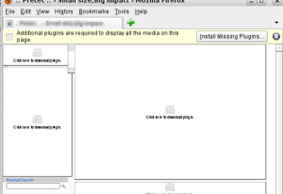 Both Chrome and Firefox have an option to enable "click to play plugins". Equivalent "Flash blocker" extensions also exist for many popular browsers: Firefox has Flashblock and NoScript, Internet Explorer has Foxie, which contains a number of features, one of them named Flashblock. WebKit-based browsers under Mac OS X, such as Apple's Safari, have ClickToFlash. Adobe Flash Player's security record has caused several security experts to recommend against installing the player, or to block Flash content: the US-CERT recommends to block Flash using NoScript, and Charlie Miller recommended "not to install Flash" at the computer security conference CanSecWest. As of July 7, 2013, Adobe Flash Player has almost 300 CVE entries, of which 234 were leading to arbitrary code execution. Security vulnerabilities in Adobe Flash Player account for a third of all vulnerabilities reported in Adobe products. 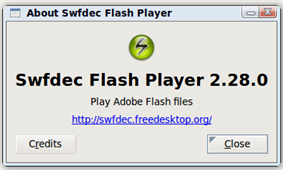 Swfdec is a free/open source replacement of Adobe Flash Player. It is compatible with Linux and FreeBSD and is distributed under the terms of the GNU Lesser General Public License (LGPL). It was released on November 11, 2008 (2008-11-11). Swfdec is a library that can be used to play Flash files. There is a standalone player and a Mozilla plugin that uses the library. Swfdec supports Flash through version 4, and most features of Flash through version 9. The player was routinely updated to support the latest features demanded by video players, resulting in most (including YouTube, Google Video, Lulu.tv, AOL video, and CNN video) working at any given time. Swfdec has been chosen as the Flash player for Fedora, and it has been ported to DirectFB for embedded use alongside its X11 and GTK+ bindings. It uses the Cairo graphics library for rendering, GStreamer for decoding audio and video and PulseAudio, OSS, or ALSA for audio playback. Development of Swfdec has almost stopped. As of December 2014 the most recent commit to the git repository was in December 2009. Lightspark is a free and open source SWF player. It implements the latest ActionScript 3. Scaleform GFx is a commercial alternative Flash player that features full hardware acceleration using the GPU and has high conformance with both Flash 10 ActionScript 3 and Flash 8 AS2. Scaleform GFx is a game development middleware solution that helps create graphical user interfaces or HUDs within 3D video games. HTML5 is often cited as an alternative to Adobe Flash technology usage on web pages. Adobe released a tool that converts Flash to HTML5, and Google also released an experimental tool that does the same. Commercial software packages that can create SWF files include Toon Boom, Xara Photo & Graphic Designer, Vectorian Giotto, CelAction2D, Toufee, KoolMoves, Express Animator, Alligator Flash Designer, Amara Web and Anime Studio. These applications provide additional capabilities for creating cartoons, especially with tools more tailored to traditionally trained animators, as well as additional rigging for characters, which can speed up character animation considerably. Additionally, there are programs available which translate 3D information into 2D vectors for display in Flash Player. Several third-party tools are able to use and generate SWF files, and some tools such as IrfanView are capable of rendering SWF files, through the use of Flash Player. Flash Player cannot ship as part of a pure open source, or completely free operating system, as its distribution is bound to the Macromedia Licensing Program and subject to proposition first from Adobe. There is no complete free and open source software replacement which offers all the functionality of the latest version of Adobe Flash Player. The Flash 4 Linux project was an initiative to develop an SourceForge. QUADRIGRAM — a platform for exploratory data analysis and visualization developed in Flash. ^ "Usage of Flash for websites". Retrieved March 4, 2013. ^ "Flash is dead. Long live HTML5". ^ "Flash to Focus on PC Browsing and Mobile Apps; Adobe to More Aggressively Contribute to HTML5". ^ Matt Fisher (2013). HTML5 for Flash Developers. Packt Publishing Ltd. § Stage3D versus WebGL, p. 91. ^ "Stage3D vs WebGL Performance — Airtight Interactive". Airtightinteractive.com. 2011-10-28. Retrieved 2014-08-04. ^ Nitot, Tristan (April 29, 2008). "'"Mozilla warns of Flash and Silverlight 'agenda. ^ "Free Flash community reacts to Adobe Open Screen Project". Retrieved November 29, 2008. ^ Flash Player. Adobe. Retrieved on 2014-05-25. ^ PC Penetration | Statistics | Adobe Flash Platform runtimes. Adobe.com (2011-09-28). Retrieved on 2014-05-25. ^ "Adobe and Google Partnering for Flash Player on Linux". Retrieved February 22, 2012. ^ "Flash Player 11 commented by Phoronix". Phoronix. October 4, 2011. Retrieved October 5, 2011. ^ Huang, Emmy (November 17, 2008). "SWF 10 spec available AND Flash Player alpha for 64-bit Linux on Labs". 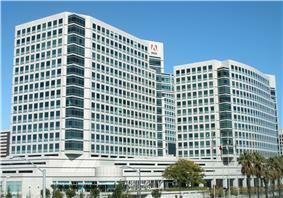 Adobe Systems. ^ Mike Melanson (November 17, 2008). "Now Supporting 16 Exabytes". Penguin.SWF Blog. Retrieved November 9, 2010. ^ Paul Ryan (June 15, 2010). "64-bit Flash for Linux dropped as Adobe preps next version". Ars Technica. Condé Nast Digital. Archived from the original on October 21, 2010. Retrieved November 9, 2010. ^ Posted on Tuesday, Apr 27, 2010 by Phil Nickinson (April 27, 2010). "Andy Rubin says Flash is coming in Froyo version of Android operating system". Androidcentral.com. Archived from the original on December 4, 2010. Retrieved December 4, 2010. ^ Apple Devices Generating Almost Two-Thirds of Mobile Web Traffic. Forbes (2012-12-14). Retrieved on 2013-07-21. ^ Hemphill, Kenny (September 15, 2011). "Microsoft ditches Flash support in tablet version of Internet Explorer". ^ Sascha Segan (September 27, 2010). "'"Microsoft Windows Phone 7.5 'Mango. PCMAG.com. Retrieved October 16, 2011. ^ "Platform_Linux Red palette is replaced with Blue". April 12, 2012. Retrieved 27 May 2012. ^ "Flash video appears blue". Retrieved March 21, 2013. ^ "Adobe Flash Player Settings Manager". ^ "Global Privacy Settings panel". ^ "Year In Mac Security: 2011". Intego. December 2011. pp. 3, 9. Retrieved April 9, 2013. ^ "Expert says Adobe Flash policy is risky". ^ "Sophos Security Threat Report 2013". Sophos. December 2012. pp. 11, 24. Retrieved May 9, 2010. ^ "2013 Threats Predictions". McAfee. 28 December 2012. p. 10. Retrieved May 9, 2010. ^ """Local Shared Objects – "Flash Cookies. Electronic Privacy Information Center. July 21, 2005. Archived from the original on April 16, 2010. Retrieved March 8, 2010. ^ Jonathan Corbet (2007-04-04). "Two approaches to Flash". ^ Kris Graft. "Scaleform GFx 4 Supports Flash 10 AS3".